It’s that time of the year when the audience expect a classic from Aamir Khan. Some of his slightly off-beat story-driven films like ‘Taare Zameen Par’, ‘3 Idiots’ and ‘PK’ have achieved the rare combination of critical acclaim and commercial success. This year, Aamir returns with yet another film for which he has dedicated nearly 2 years of his life. From gaining 30 kilos of weight to losing it all to play the younger character, Aamir put his health at risk to physically transform himself. All for one film. Is it worth all the effort that has gone into it? Is Dangal yet another classic from the superstar? No better time to find out than now. Story: Dangal is about Mahavir Singh Phogat (Aamir Khan) and his two daughters Geeta (Fatima Sana Shaikh) and Babita (Sanya Malhotra). Mahavir’s dream is to have a son who he hopes to nurture and train, so that he becomes a top wrestler, who can win medals for the country. His dream is shattered when he and his wife (character played by Sakshi Tanwar) are blessed only with daughters. Mahavir later realises that his daughters are stronger than most boys in the locality. He decides to train them, hoping that they can someday win gold medals for the country. The story has many other angles including the one where Mahavir realises that his vision may not actually be best for his two champion daughters. Review: Dangal is one of those films that has a lot to offer, so much that it’s difficult to absorb it all in the first viewing. Not only is the film entertaining, but it also serves up an inspiring life-journey of two daughters who are put through rigorous sessions of training and hard work, only to eventually learn to take their own decisions and even better their own champion father. Dangal has life-lessons, but the film never gets preachy. The wrestling sequences can get boring after a point, but it has humour and emotions to keep the audience involved throughout. Nitesh Tiwari excels both as the co-writer and director, it’s easily the best film of his career. Dangal shines when it comes to the technical aspects of the film. The cinematography (Sethu Sriram) is top notch, the heartland of India and the rustic feel of its beautiful villages has been captured in the best possible way. Editing (Ballu Saluja) could have been better, the length should have been shorter as Dangal feels a little longer than it should. The music (Pritam) is excellent and blends well into the film. Acting: Aamir Khan is outstanding as Mahavir Singh Phogat. Words cannot describe the amount of effort that the actor has put into Dangal. Whether it’s his dialogue delivery, expressions or body language, Aamir gets everything right. The rest of the actors are perfectly cast too. Fatima, Sanya and Sakhi Tanwar are brilliant in their roles. The child actors play their parts very well too. Overall, Dangal is one of the best films of 2016. 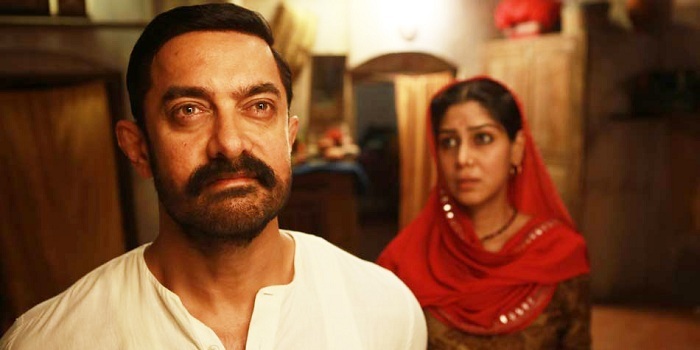 Aamir’s performance and effort alone more than deserves the price of the movie ticket. It may not be a film that would be liked by those who seek an out-an-out entertainer, but Dangal is an experience that should not be missed. More so when 2016 has been a disastrous year when it comes to quality of films. Best film of the century. huge blockbuster on its way.not a single person who bashed this movie. Only 2 or 3 critics have given Dangal less than 4 stars. Rest every other critic has given a 4 star, 4.5 star or 5 star rating to Dangal. And not a single negative review or rating less than 3 stars! 387 Crore kat like air WW 2000 Crore….ab bta SalluFan?? Frankly speaking ….movie doesn’t promise anything new as compared to sultan …same plot ! Same message …. No doubt Amir sir gr8 actor ! Finally the wait ended and watched my most awaited film in last 2 years. Everyone is aware about the story of the movie so no need to discuss this, all i can say that the story is worthy to show on big screen. Screenplay was fantastic, the film keep you engaged from start to end with many emotional and comic moments. The use of wrestling and detailing were superb. First half is brilliant, almost flawless.Second half start slow but the film picked in 15mins and after that unstoppable till the end. Music was superb, it blends well with the movie and the Dangal title track excite you whenever it played in background. The cinematography and technical aspect were great. Performance is top notch. Everyone is so fantastic in their role. Special mention to the kids who played geeta, babita and their cousin. Aamir is Aamir, words are not enough to describe his acting, all I can say. Hats off sir. It will give 4.5/5 for Dangal, Its easily the film of the Year for me and I have said this many time every since its shooting started. The audience response will be terrific too. People here can compare Sultan with Dangal, earlier I thought that Sultan might affect Dangal but actually its opposite, the kind of wrestling we have seen in Dangal with so much detailing and reality, I wonder what would happen with Sultan if Dangal released earlier. I want to clear it here that I loved Sultan very much but Dangal is one step ahead than Sultan for sure. At Boxoffice, There will be tough competition of Dangal and Sultan, as the demonetisation and lack of holidays can be hurdle. But I am confident that Dangal will surpass Sultan at boxoffice. Though PK will be tough for Dangal. Lets see how it fares. Dangal earned $350,000 in the USA/Canada from Wednesday previews. These previews happened from 7 pm to 12 pm at night, which means it earned $350,000 in 1/4th of a day. Seems like the reviwer was in too much hurry or may be he dosent have words to describe the greatness of the movie.. But the kind movie reviwe should have been longer side to praise movie and Amir.. Anyways hearing great thing about movies.. Never fan of amir but big fan of his movie.. Will watch it tomorrow. Honestly speaking i was excited about dangal and watched the 1st show but i liked sultan more.. maybe bcoz i like entertainment factor more in films. And dangal gets preachy some times..
Can’t expect anything less from an Aamir Khan starrer. He doesn’t need to come on silly shows to promote his movies, his movies speak for itself. Meanwhile I am in theatre right now and can say that the trust he has built over us people is just unmatchable. Not even a single vacant seat here. Despite the raving reviews, I don’t think Dangal will cross 300cr. One of the reasons may be the lack of entertainment for single screen audience to come out in big numbers. Another big reason is the fact that it will not be able to take advantage of Xmas and New years as they both fall on sundays, those extra holidays alone give additional 20-30 cr to a film. The last reason is the similar theme to Sultan and wrestling is not an attractive theme to begin with. Dangal is getting exceptional reviews . Looking at your review I was expecting Dangal to get 4 Stars but you have given 4.5 Stars . I am planning to watch Dangal on Sunday . Aamir’s performance has been appreciated by one and all along with Fatima, Sanya and Sakshi Tanwar . Dangal is the most critically acclaimed film of the year beating Udta Punjab, Airlift, Neerja and Pink . !!!!!!!!!!!!!!!!!!!!!!!!!!!!!!!!!!!!!!!!!!!!!!!! !